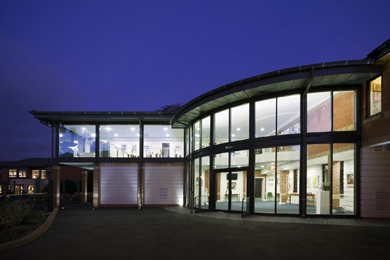 Dulwich College (Preparatory School) in South East London employed SGCI via the main contractor and their electrical sub-contractor to provide detailed design and commissioning of a DALI lighting control solution for their new music school building. The L-DALI system designed and commissioned by SGCI showcased the compact modular capabilities of the LDALI system by way of employing a single 2-channel multi-master controller in standalone mode with multisensors and dimming/ switch plates for user control. The intelligent multi-sensors used along with the dimming/ switch plates, photocell and relay output module were of LON (LonMark) types interfaced to the LDALI byway of the local FT port on the L-DALI controller. The Ethernet IP port of the LDALI was used to allow maintenance technicians to download the emergency test results into a laptop. Emergency lighting was incorporated into each emergency type light fitting byway of a Tridonic EM PRO EZ 3 emergency control gear directly programmed and configured into the LDALI controller/ system for emergency test procedures to be automatically undertaken, also a manual key switch test can also be instigated this enables a manual test via the LDALI.